We outline expert combat techniques from the Santa Monica Studio team. Heyo! My name is Mihir Sheth and I’m a senior combat tech-designer here at Santa Monica Studio. 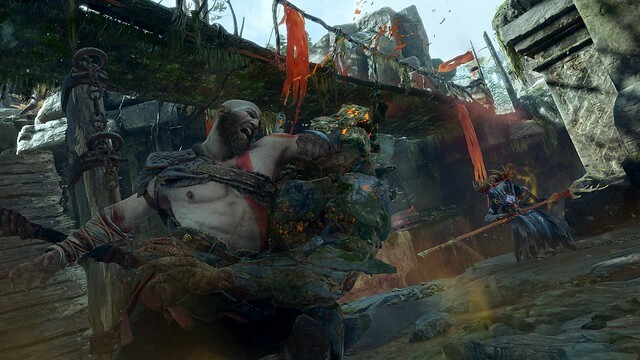 Now that God of War has been out for some time – and plenty of players have experienced the combat themselves – I wanted to take a moment to talk about “Give Me God of War,” the hardest difficulty mode available. As many of you have likely noticed, Give Me God of War sets itself up ominously with bold red text stating that the difficulty cannot be changed mid-game. It’s not for the faint of heart! As you face it for the first time you’ll likely be overwhelmed during the opening hours of the game. Hopefully this post (along with the plethora of great player-made resources already online) can remove some of the mysticism behind the difficulty mode, and offer some advanced combat tips and techniques in the process! It is strongly suggested that you play through the main story at least once before on either Give Me a Balanced Experience or Give Me a Challenge to gain familiarity with the combat systems. 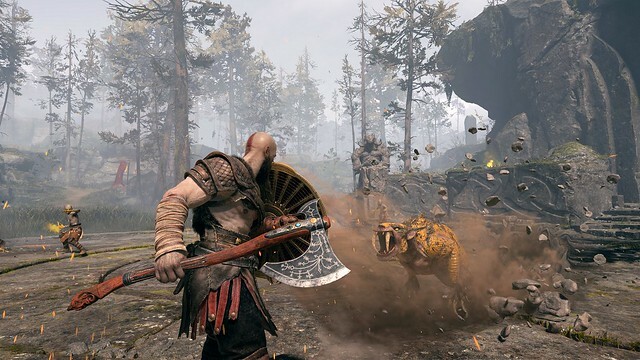 Control of the player camera is extremely important and is central to the combat experience in Give Me God of War. If you’re having trouble with controlling the camera in large fights, we recommend disabling the “Lock-On Camera” (Gameplay) and “Recenter Camera on Attack” (Camera) options in the Settings menu. They are helpful in situations with a singular or very small group of enemies, but might make fights with a large crowd difficult for some. There’s no correct way to play – feel free to adjust the camera settings until you find something that is appropriate. Give Me God of War is meant to test mastery of all the combat mechanics and tools available to Kratos and Atreus. The more you explore and attempt to master the combat system, the more you will enjoy the difficulty! Enemies are much stronger and have a slightly higher Power Level. Their damage output, defense (against both damage and stun), and resistance to hit reactions are all significantly increased. Enemies can counter attack quickly after taking hit reactions or blocking an attack. Enemies can turn Elite, greatly increasing their combat prowess. Elite enemies have glowing eyes, an increase in Power Level, increased aggression, and have access to new attacks and attack patterns. Different enemies have different rules for when and how they turn Elite. Status ailments applied to Kratos are far more potent and linger around for a longer period of time. Health shards remove status ailments and reduce accrued status damage when consumed. Use them to prevent an ailment from turning active. There is less targeting assistance during melee combat. Kratos will no longer slide forward to meet his opponent with every strike, requiring more precision in judging distance. The rate of gaining Rage and passive bonuses such as Permafrost are significantly reduced. Keep your camera focused on as many enemies as you can. 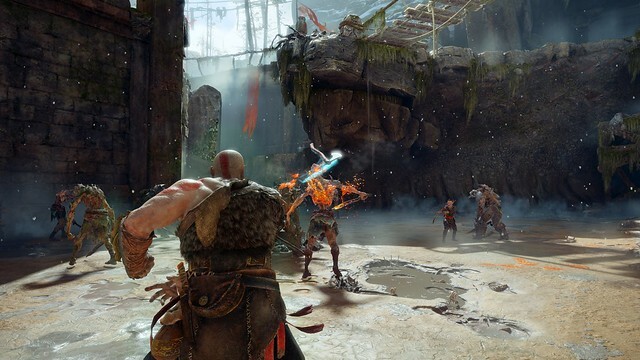 Mastery of the camera is extremely important as Kratos’ melee attacks will direct enemies towards where the camera is facing. Get comfortable weaving in evasive sidesteps between your attacks. This helps you reposition during your aggression while keeping you safe. You will maintain the “sequence” in your light attack combo as long as you just side step; rolling will get you out of the way but will reset your combo. Getting to the last hit of your light combo is very important! Fully master the Leviathan’s Freezing Throw (heavy axe throw). It is very potent at quickly dispatching enemies and applying crowd control to an area. Be comfortable leaving the Leviathan frozen in an enemy without immediately recalling it. Use the time to reposition and weaponize the frozen target to your advantage. Prevent enemies from turning Elite. Either attack them using Atreus’s arrows or with a well-aimed axe throw to disrupt them from range. Enemies afflicted with the Frost ailment cannot turn Elite, and are defenseless against a relentless offense. Enemies afflicted with the Burn ailment will take damage over time and often get interrupted during their attacks. Stunning draugrs is an effective way to apply Burn to nearby enemies. If an enemy has already turned Elite, or if there is a particularly difficult enemy in the fight, try to weaponize other weaker enemies in the battlefield against it. Bare handed attacks build up more Rage meter and deal more Stun damage. Hit enemies in the back to maximize Stun damage output. Learning simple but effective combos with precise axe throws will allow you to make use of both of these techniques. Tripping enemies with precise axe throws is an effective way of managing a crowd of enemies. Hitting enemies into walls leaves them in a vulnerable state where they are incapacitated and take increased Stun damage. Also, sending enemies flying back into walls will cause them to bounce off, dealing large amounts of Stun damage. Instead of isolating enemies, try herding them together. Juggling enemies after they have been launched into the air will keep nearby enemies disrupted and unable to attack. Attacking an enemy just as it lands will cause it bounce on the ground, resulting in an Off The Ground (OTG) combo. This technique is tough to get a grasp on but mastering it will open up many possibilities. Use firepower from Atreus to help extend juggles on an enemy. Any time an enemy is being juggled is time they aren’t attacking! Despite being a risky move to pull off in the middle of combat, kicking an aggressive enemy can leave it open for attack. While Fury Strike (light attack) is a great option in Spartan Rage to focus on one enemy and regain health in the process, it is not always the most effective key to victory. Every attack costs valuable Rage meter so prioritize using your Rage meter to damage as many enemies as possible when facing an overwhelming horde. Remember that merely the act of entering Spartan Rage is a powerful move effective at displacing and launching enemies. Thanks for reading and I hope you’ve learned a thing or two to help your gameplay (regardless of whether you’re playing on Give Me God of War or not!). It’s an uphill trial of skill and patience, but with the right knowledge, technique, and tenacity the journey will be worth it. Just finished the game on normal. It was spectacular! I however I started the game on give me a challenge difficulty but changed it to a balanced experience after I defeated the Alfheim boss. Holy, that was so hard! Thanks for the great game and I am so looking forward to God of War 2! Any plans for a New Game+ mode later? Best ultra hard difficulty I’ve ever experienced! So many great changes/additions that make sure you stay on your toes! Died a bunch, but I’m glad I chose it for my first playthrough. Bested it though, and am doing a hard playthrough for the Platinum. Feels like a cakewalk. Where are the gifs? The post on Santa Monica’s website had a bunch of gifs..
Did my first playthrough and platinumed on give me god of war. Very proud of it. So challenging but rewarding. Only wish for a new game + like everybody else but it would probably break the game. Best tip I can give is get in the habit of using Atreus’ bow and stun attacks. Use the bow to keep the stun meter going and don’t be afraid to get aggressive. I beat it on “Give Me God Of War” difficulty which was extremely challenging and fun, but I feel robbed since didn’t get a trophy from it! I usaually don’t care but in this case I want my trophy!! !